Welcome to Serenity by the Seashore - take it all in while you relax in this beautiful private patio space. 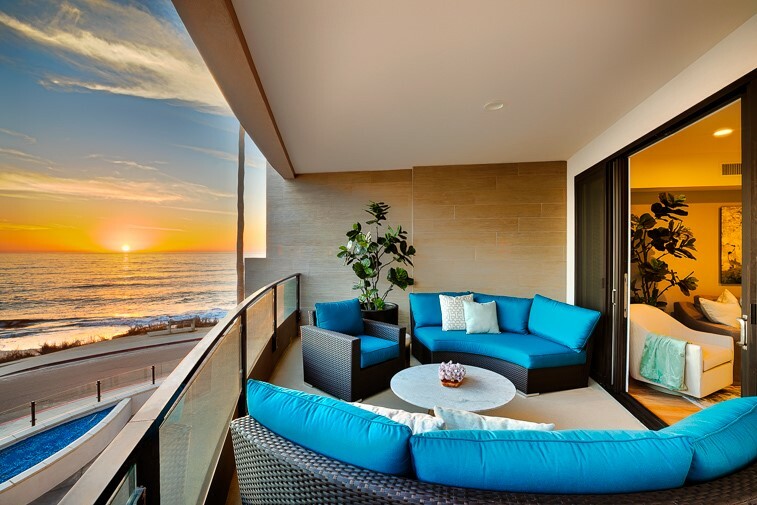 Exquisite outdoor balcony - perfect place to enjoy the changing ocean and sunset colors. A private haven - covered lounge area off the master suite. Living area of the great room with access to ocean view patio and a large flat screen TV. 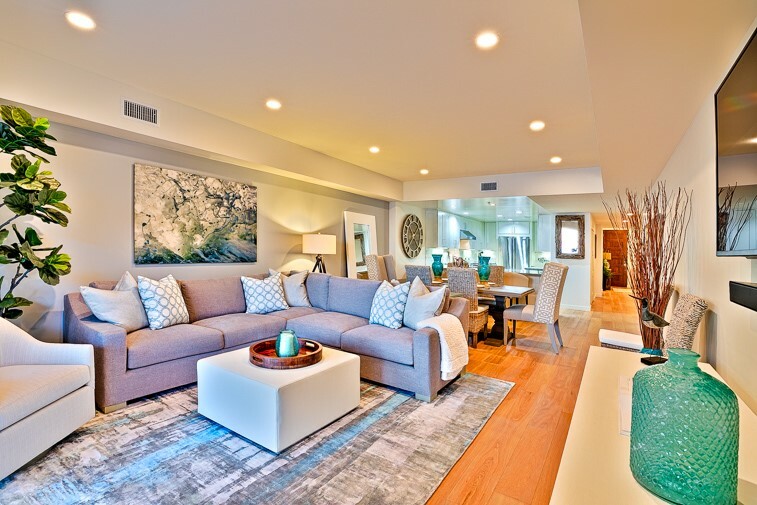 Exquisitely appointed Living Room area with lots of comfortable seating so everyone can be comfortable together. 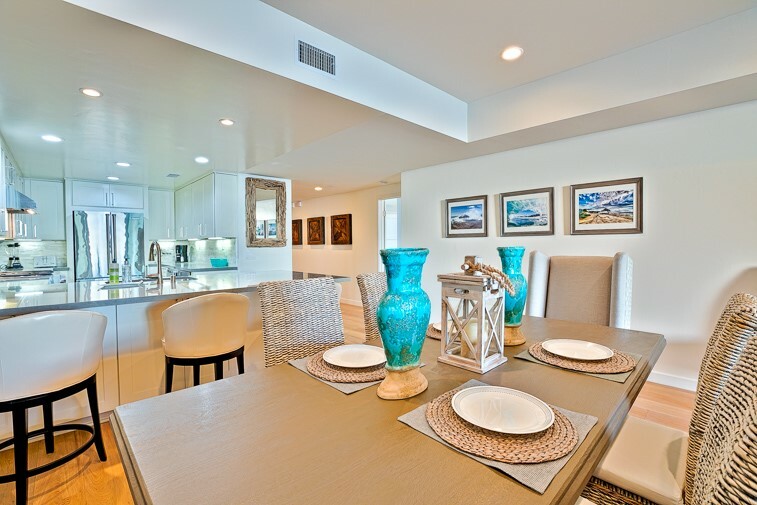 Soft seaside decor and colors for the large dining area for 6 and a modern kitchen. 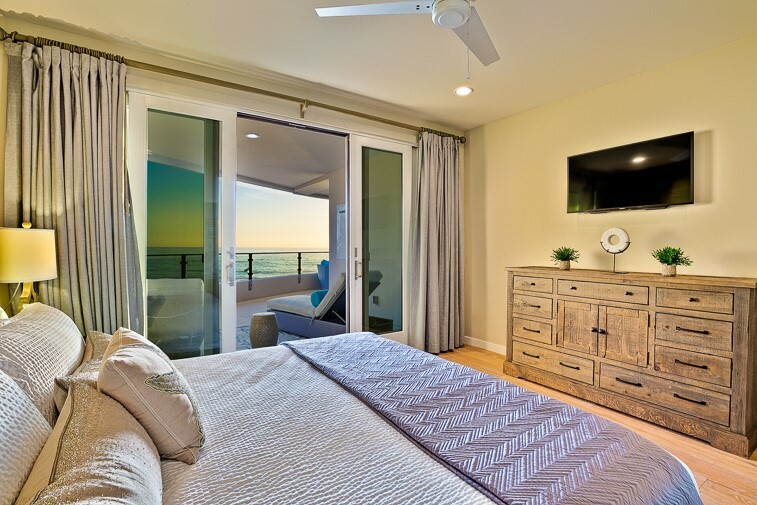 Master King Bedroom with ocean views ad sliders to private patio. Front view of boutique luxury condo complex. Beautifully functional Great Room - alternate perspective. 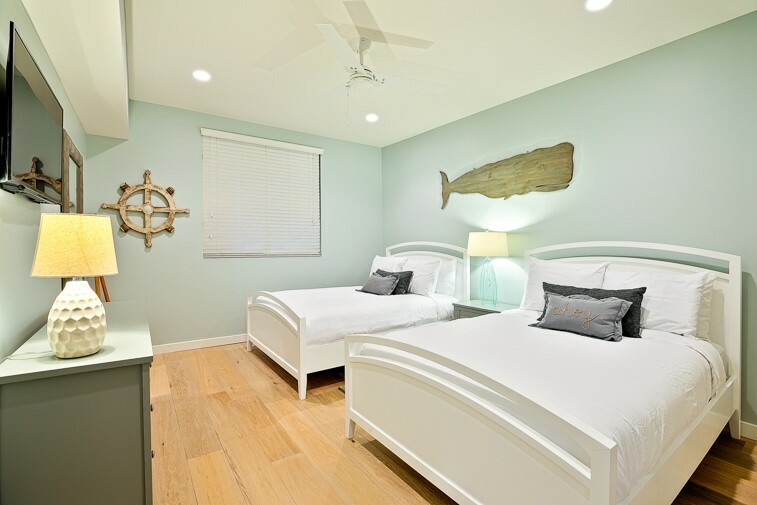 Beach decor and wonderful attention to detail creates a delightful, comfortable space for all. 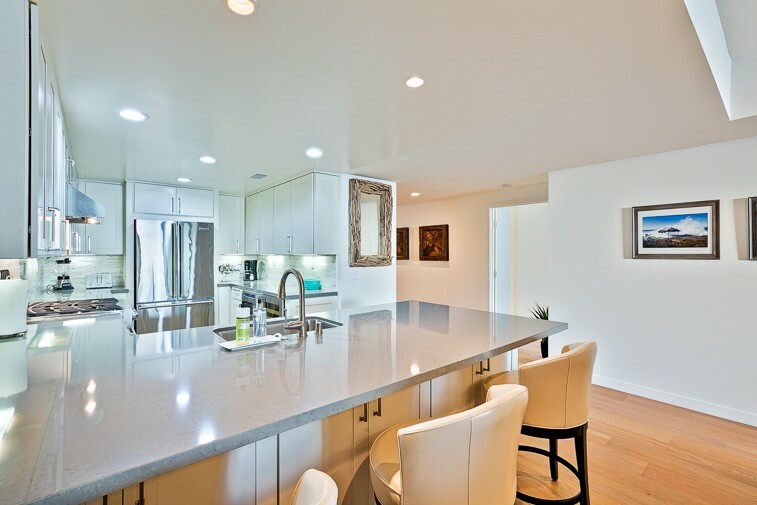 Dining Area up close with adjacent, open, modern kitchen with bar seating. Modern decor creates an ambiance of elegant luxury throughout this home. 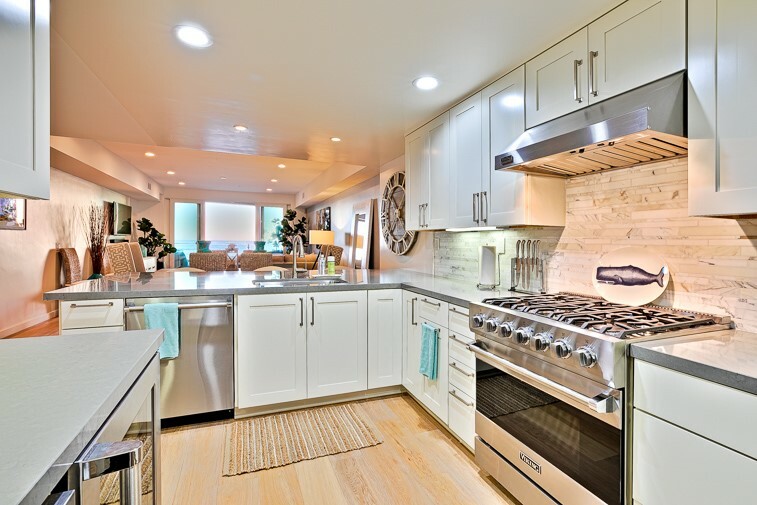 Modern open kitchen for cooking and communing. All new Kitchen with stainless steel appliances and lots of counter space. Kitchen - another perspective. The Kitchen in its entirety. King Master Suite with a peek into the ensuite bath. 2nd Bedroom with 2 full beds and an adjacent full bath. 2nd Bedroom with ceiling fan for your ultimate comfort. 3rd Bedroom with 2 double beds and a large flat screen TV. 3rd Guest Bedroom - alternate view. 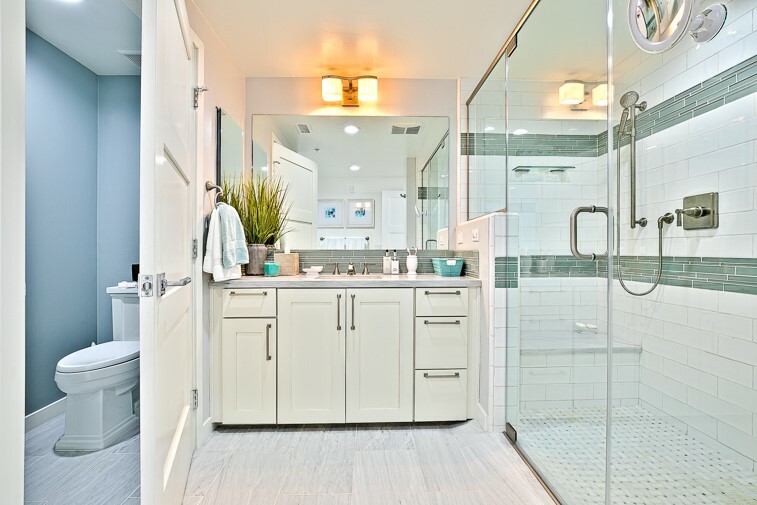 Master bathroom with large walk-in shower. Master bath & toilet. Guest Bath with shower/tub combination. Guest Bath - representative of 2nd and 3rd bathrooms. Entrance to this beautiful seaside sanctuary. From the hallway looking back towards the front entrance. Washer/Dryer for your use and convenience. Nourish body, mind, and spirit in this newly constructed, luxurious. 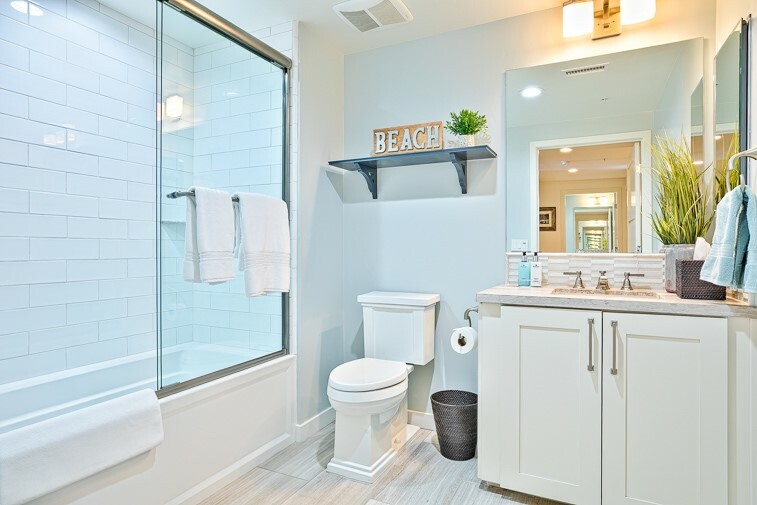 oceanfront boutique condo that invites you to take a time out to enjoy the panoramic surf and sunset views on Windansea Beach - just steps away. 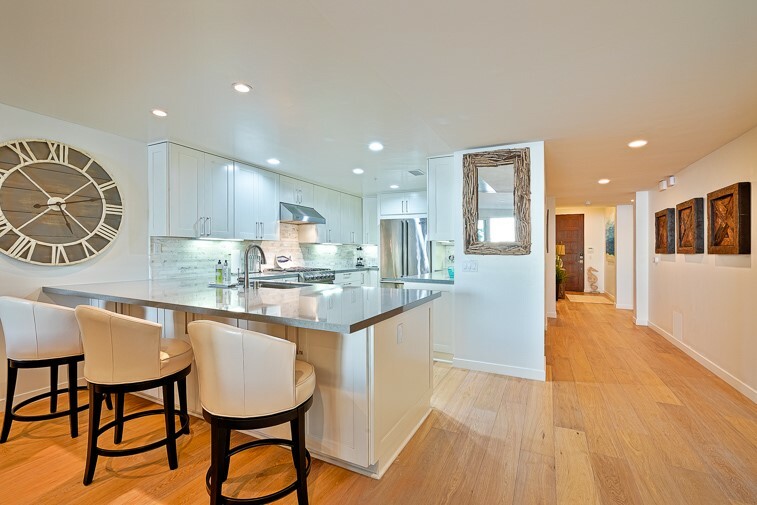 This 3 bedroom 3 bath 2nd floor 1910 square foot refuge is also within walking distance of charming La Jolla Village with many coffee shops, world class restaurants and shopping. Sweeping ocean views from an extraordinarily large and beautiful waterfront terrace, the master bedroom, and the living room allow you to go to sleep and wake up to soothing ocean breezes and the ever-changing sounds of the surf. 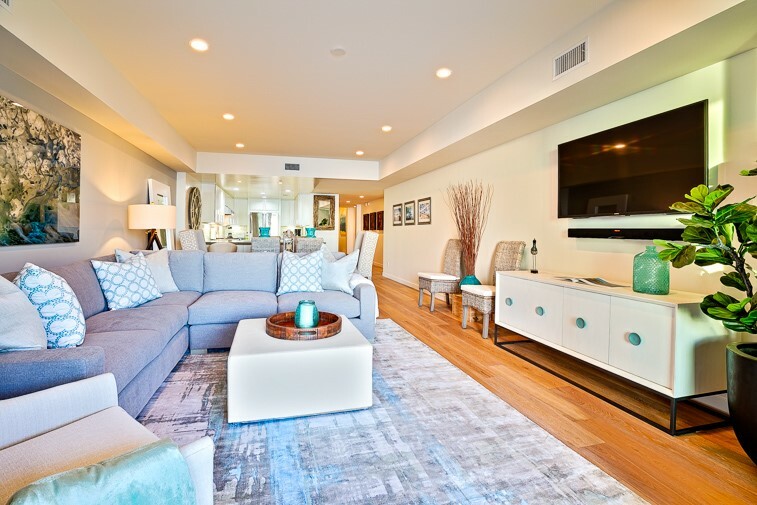 Brand new furnishings and tasteful beach décor make this the perfect place for a seaside getaway starting with a large spacious living room with slider access to the oceanfront terrace, and lots of comfortable seating - creating the perfect ambiance for relaxing, connecting, and recharging. 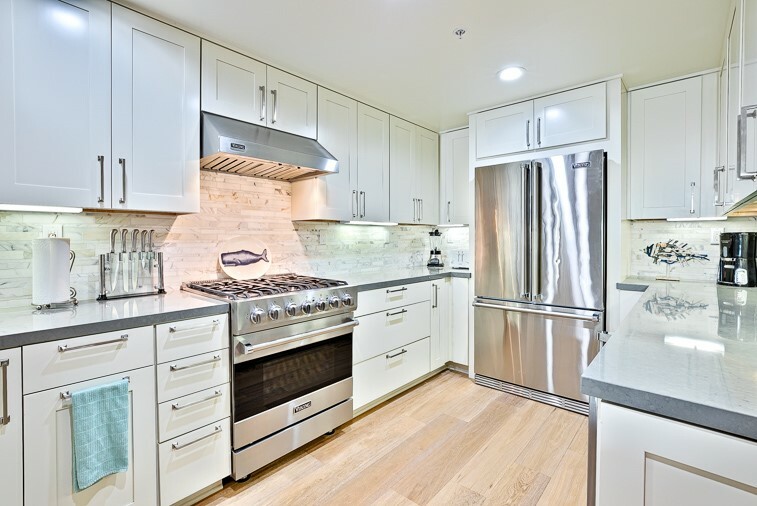 Cook and enjoy everyone from your open fully equipped kitchen with all new appliances, bar seating, and a seamless flow to the living room and ocean view terrace. A comfortable, well-appointed dining room that seats 6 rounds out this spacious great room. The king master suite has comfortable lounge chairs on an ocean view terrace, making this a sweet and private spot to bask in your environs. A beautiful designed full en suite bath with a shower and tub complete this private enclave. 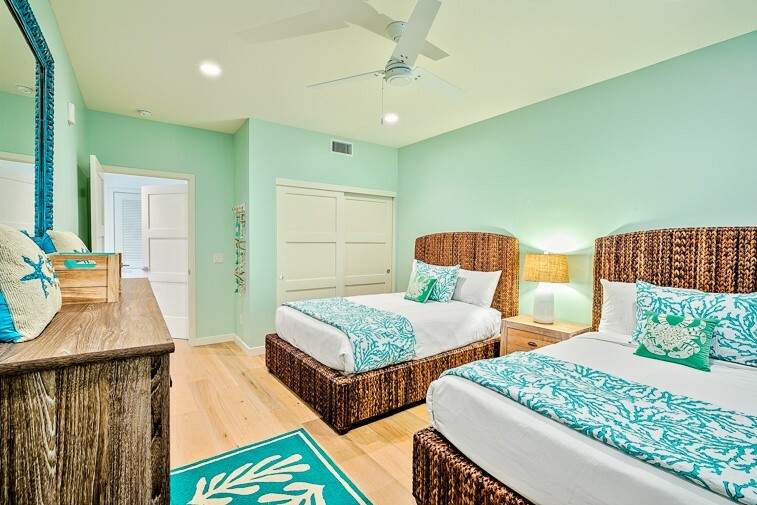 Two additional guest bedrooms each with 2 double beds each makes comfortable sleeping for 5. Each also has an adjacent full bath and one of the bedrooms also has a large flat screen TV. All bed and bathrooms are outfitted with luxurious linens for your ultimate pleasure and comfort. This home also has a washer and dryer and AC throughout. In this gated community there is parking for one car in the garage as well as street parking, an elevator, and an outdoor shower. 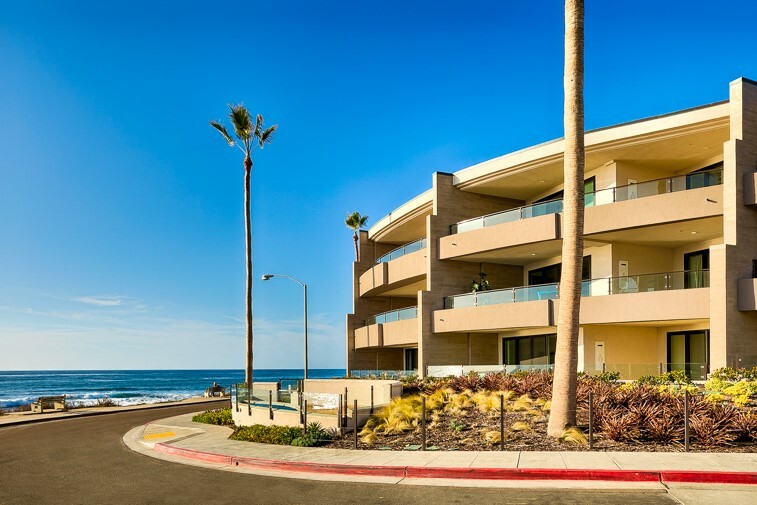 You will be glad you found your way to this premiere beachfront condo on one of the world’s most beautiful beaches within walking distance of La Jolla Village. Freeway access is not too far away so you can easily visit the many world-class attractions of the greater San Diego and/or Los Angeles areas if you wish to augment your seaside adventure. Steps to the sand with sweeping ocean and sunset views from outside terraces, the living room, and master bedroom. 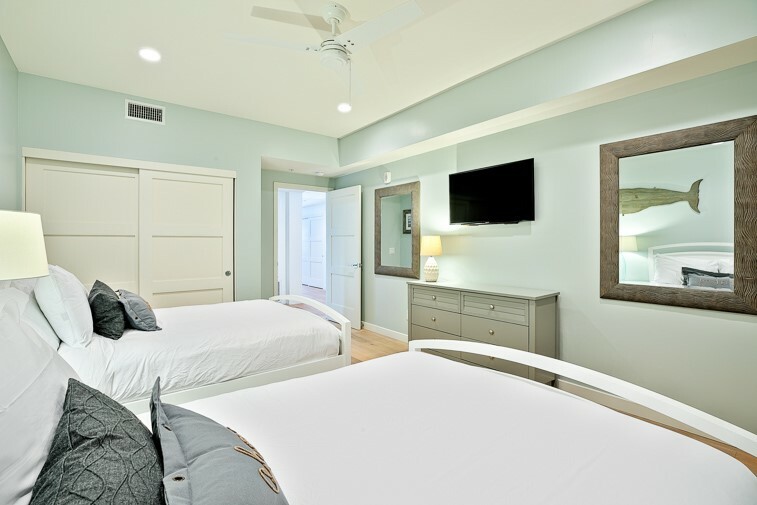 Within walking distance to charming La Jolla Village and easy access to freeways for visiting other world class attractions such as The San Diego Zoo or Disneyland. Brand new, wonderfully decorated and appointed inside and out with your ultimate ease and comfort in mind. There is 1 parking space in the garage that will accommodate a medium size car or small SUV only. Street parking available but limited. This home accommodates a maximum of 5 people per the owner’s request. This house is equipped with air conditioning. There is a 7–day minimum and no pets are allowed. Cleaning Fee's - Sea Breeze uses only legal housekeeping companies who are dedicated to paying a living wage and carry all legal insurances as required by law. - Reviewed By Randall P.